This card will be amazing in almost any deck. Even minion heavy Hunter has quite a few spells. This is probably one of my new favorites and I'm sure this will be played often, quite possibly the new Taz Dingo. If not killed by other minions immediately, it will draw some hard removal in spell based classes. Isn't he a good miracle rogue-counter card just like Loatheb? It's like your opponent has to think twice before playing a spell card each turn while he's on the board. This card effect is not controllable and easy to play around so it will probably not be used in any form of constructed. As for arena it will be play for it's stats but will never outshine yeti, sen'jin or violet teacher. The +2 Attack is permanent, be sure this card will dominate the meta! So what happens when it's targeted by Shadow Word: Pain ? Is it destroyed or does it go up to 5 attack ? Thanks, I should have checked this. We got ourselves a reverse and stronger Mana Wyrm I am still waiting for reverse Knife Juggler : when your opponent plays a minion deal 1 damage to random enemy character. 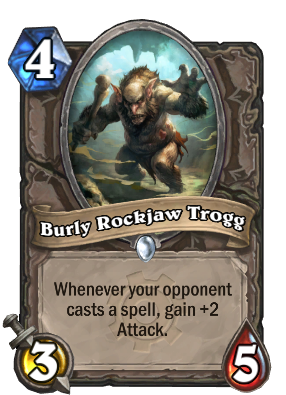 Me: Conceal Burly Rockjaw Trogg. He can play sabotage to kill your concealed trogg and draw a card which will be a very efficient play for him. I like the card, it will definitely be strong. The downside being, this will be difficult for Control/Spell decks. Mages/Priests will have a hard time with this card. I'm worried for control decks in this new meta. They will probably have to switch to some kind of mid-range with lots of early removal options they don't typically run. 2x SW:P and Smite for priests might become a norm. Well, it was bound to happen eventually. One of the most hideous races has made it into Hearthstone as a card. It's like Uldaman all over again, the horror! Nice card. Solid body... bye bye yeti's. I love this card, this is fantastic!